(CNN) -- Nico Rosberg topped the practice timesheets yet again as reigning champion Lewis Hamilton showed improved form in his McLaren ahead of Sunday's Monaco Grand Prix. Rosberg has topped the timesheets in nine of the 16 pre-race practise sessions so far this year. 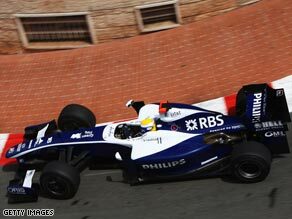 Williams driver Rosberg, who has topped nine of the 16 pre-race practise sessions, clocked a time of one minute 15.423 seconds on the famous street circuit at Monte Carlo, edging McLaren's Hamilton by two tenths. The Brawns of Rubens Barrichello and championship leader Jenson Button finished third and fourth ahead of Saturday's final qualifying. Barrichello had been fastest in the morning session ahead of Ferrari's Felipe Massa, who finished fifth in the afternoon runs. It was an encouraging return to form for Hamilton, who told CNN ahead of the grand prix that he had "no doubts" his team could return to the top of the podium again. "With some more developments we will get there and we'll be back to winning," he added. Hamilton, who won in Monaco last season on the way to his narrow title win over Massa, has secured only nine points in five races this season. Rosberg. the 23-year-old son of former world champion Keke, has been unable to convert his impressive practice form into races with a best of sixth place this season. His fellow-German Sebastian Vettel of Red Bull was sixth fastest in the afternooon ahead of Finns Heikki Kovalainen of McLaren and Kimi Raikkonen of Ferrari. Button, who has won four of the five races this season, and Barrichello occupy the first two places in the championship ahead of Vettel. Brawn are dominating the constructors' championship and completed their meticulous preparation for Monaco with last-minute wind tunnel testing on Monday at their Brackley headquarters in England before heading to the principality. Friday is traditionally a rest day at the Monaco Grand Prix which is one of the highlights of the F1 calendar.